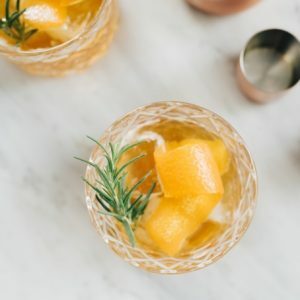 This honey bourbon cocktail with rosemary simple syrup is just the right amount of sweet and savory to share with friends during a cozy and cool cocktail hour. The rosemary simply syrup is subtle but distinctive and worth the extra few minutes of prep. It’s Friday, so you know what that means…Cameron and I survived another week with a newborn – huzzah! While that is reason enough to toast, we upped the ante and socialized. With actual people. And we didn’t fall asleep halfway through dinner. Miracle of miracles. Friends came over to meet the baby and we had a blast catching up. 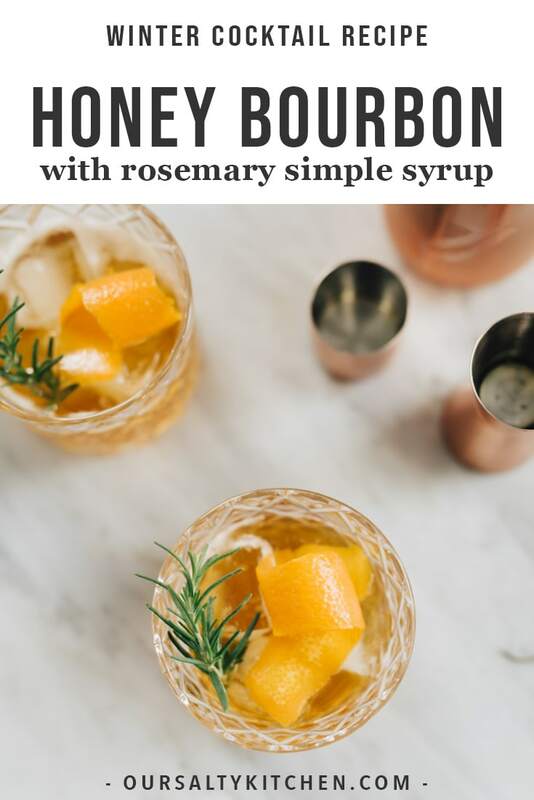 I made this honey bourbon cocktail with rosemary simple syrup, and it was divine. Just the right amount of sweetness with a hint of rosemary. 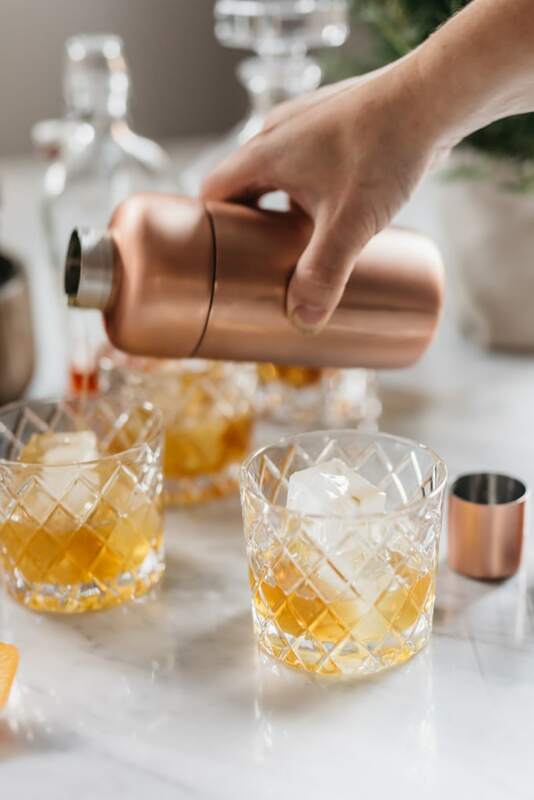 You can use any bourbon of your heart’s desire for this honey bourbon cocktail as long as it’s not bottom of the barrel – there are some things honey can change, but bad bourbon isn’t one of them. Besides, friends don’t let friends drink crappy spirits. I went ahead and made ours with Jim Beam because kids are expensive, and the ‘ol liquor budget’s definitely taken a hit since little bit’s arrival. But I digress, and I’ve now lost my train of thought – a common occurrence when you’re only racking up 4 hours of sleep each night. Where was I? Ah yes…rosemary simple syrup. Seriously, shut the front door, walk into the kitchen, and make this simple syrup. It will take you all of five minutes, and it’s worth every single expended moment. I love this simple syrup because it’s totally refined sugar free, therefore healthy. Okay, fine, that’s a stretch, but it is factual that it’s not as cloyingly sweet as white sugar simple syrup, and that subtleness is exactly what a honey bourbon cocktail needs. 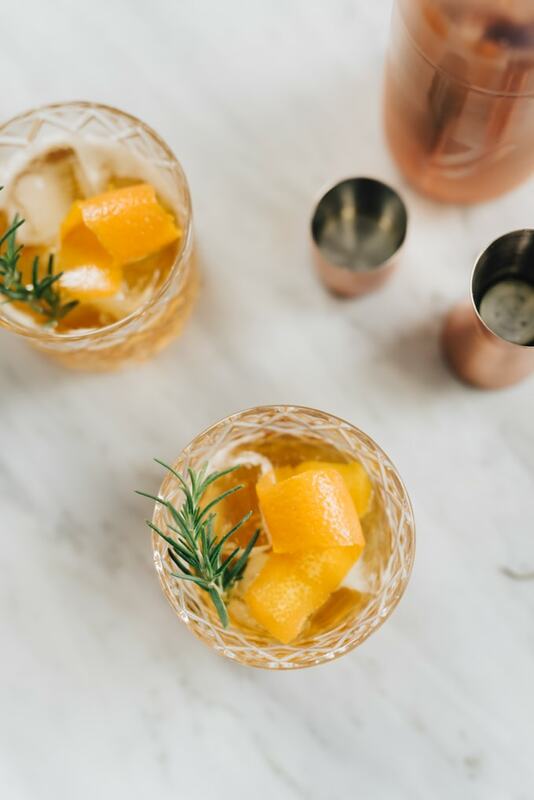 The hint of rosemary after it’s steeped in the simple syrup is just that – a hint. A tickle. A little more than a suggestion. 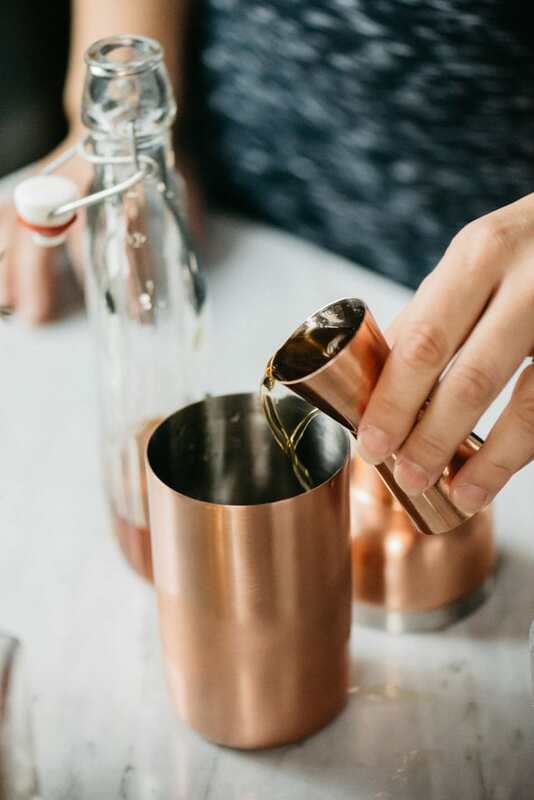 It perfectly ties together the earthy notes from the bourbon and the buttery notes from the honey simple syrup. A little orange peel adds that final, fresh touch. In other words – perfection. I wish you all the happiest of weekends and shall live vicariously through your full nights of sleep. Bottoms up! Need another cozy fall cocktail? 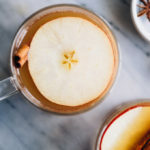 Try my apple cider hot toddy. It’s warm, soothing, sweet and spicy. It’s a seasonal cocktail recipe that will warm you from head to toe. 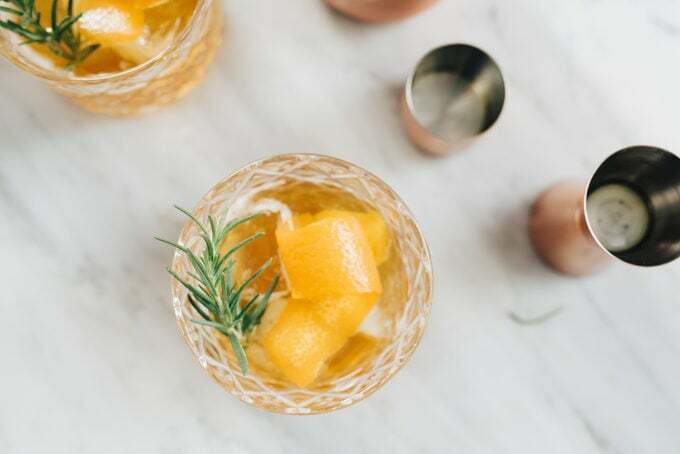 This honey bourbon cocktail with rosemary simple syrup is the ideal fall cocktail. It's sweet and refreshing, with the perfect hint of rosemary. Fall cocktail perfection! Pour the honey and water into a small saucepan and stir to dissolve the honey. Place the rosemary spring into the honey water. Place the saucepan over high and heat until the liquid comes to a boil. Remove from heat, and set aside to cool for 10 minutes. Once cooled, remove the rosemary sprig. The syrup will keep in the fridge for about a week. Place 2-3 ice cubes into a rocks glass and set aside. 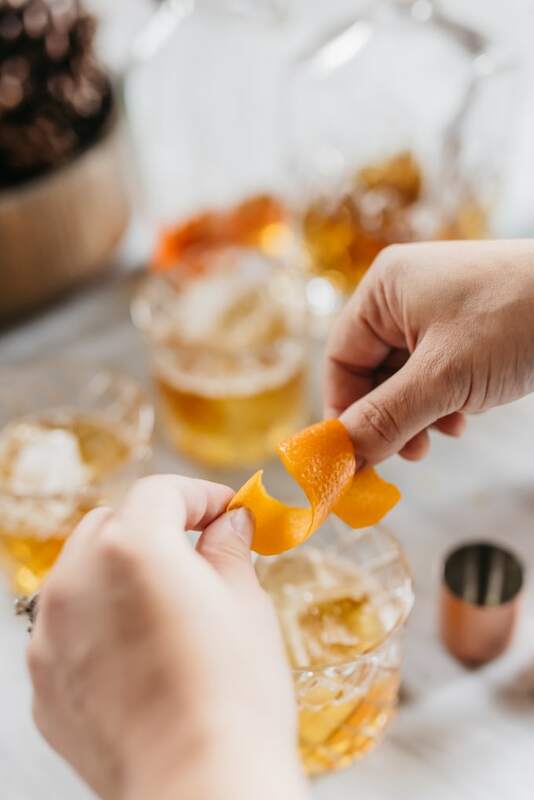 Using a paring knife or a vegetable peeler, peel a 3" strip from an orange for garnish. Fill a cocktail shaker with ice. Pour the bourbon, rosemary honey syrup, and bitters into the cocktail shaker. Stir to combine, and pour the cocktail into the rocks glass. 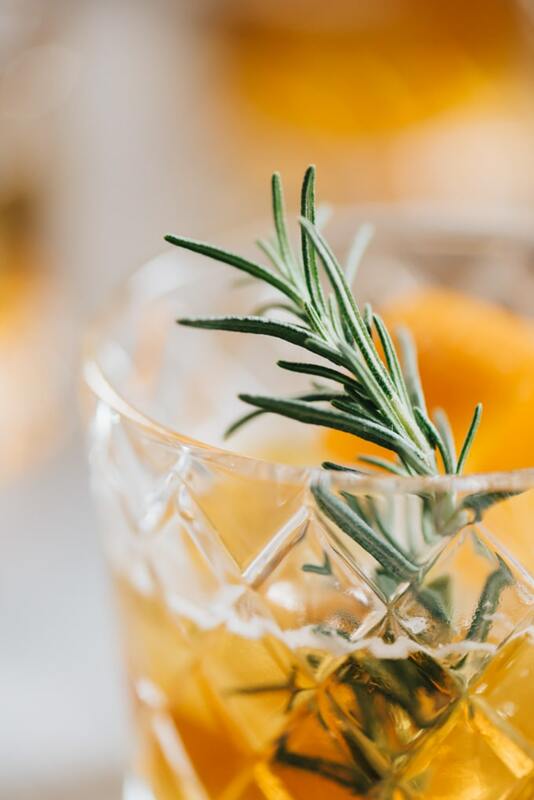 Twist the orange peel over the cocktail and garnish with a rosemary sprig. Disclaimer: This post contains affiliate links, which means we receive a small commission if you make a purchase using these links.